Brazil’s 208mn population has given rise to a sizeable healthcare sector and to the sixth largest pharmaceutical market in the world. In 2017, retail drug sales, based on pharmacy purchase price (PPP), rose by 11.7% y/y to BRL 56.8bn, supported by strong demand for both innovative patented drugs and generics. Yet, volume-wise the market decelerated, growing by 6.1% y/y, the slowest pace in a decade, as a result of the high unemployment, the decreasing disposable income of the population and the reduction of the number of private health insurance plan holders. As a result, the domestic pharmaceutical production continued to decline, propelling further the ongoing restructuring of the industry. This scenario has also put increasing pressures on the chronically underfunded public health system, outlining the need of an urgent reform of the national health model. 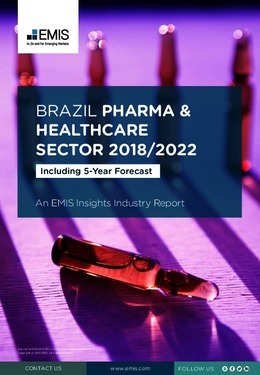 This report provides a complete and detailed analysis of the healthcare and pharmaceutical sector for Brazil . EMIS Insights presents in-depth business intelligence in a standard format across countries and regions, providing a balanced mix between analysis and data.